Daniel Hatch. Seed of Destiny. 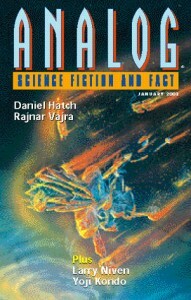 A story set on the same world as the author’s ‘Seed of Reason’ (Analog, April 1999). Jerome Sullivan is a young human going through that awkward phase between adolescence and adulthood, which humanity has obviously been unable to remove from our genetic makeup in the centuries ahead. He is on a planet which features a wide range of sentient races, and which provides a conundrum, which he is pondering, and which he is close to solving. (It all felt a little contrived to me). No sooner are we introduced to the setting than the plot is underway, with him being kidnapped by one of the said races, ‘Red Monkeys’. They wish him to do their evil DNA-related machinations. He is clever enough to trick them, and brave enough to dismiss a severed digit and the consequent pain, just in time for the matriarch of the Red Monkeys to enter, scene left, to retake the rightful role of the female-led race. Daniel M. Hoyt. Background Noise. A young man, slightly nerdy, falls for a beautiful waitress at the local diner. Imagine his horror when it turns out that she is in fact a hologrammatic projection. Furthermore, strange things are happening with the hologrammatic humans populating the nearby advertising hoardings. Kyle Kirkland. Cult of the I.
Larry Niven. The Ones Who Stay at Home. Niven uses the Draco Tavern to ponder September 11th. For me there are two main concern (above and beyond the fact that I tend to find the Draco Tavern tales somewhat of a chore). Firstly, that in the far future Sept 11th is the terrorist act which springs to Draco’s mind. And secondly, that in the story Draco does not evidently benefit from knowing what happened in the years after that event. And also – the aliens in Draco Taverns come in all shapes and sizes and have a range of preferences for drinking, but all seem to get on perfectly well with each other. A bit like Star Trek, where is seems bizarrely different aliens can get along quite famously – certainly more so than humans who are born only half a planet away from each other. One of the main criticisms/attractions of Analog is that many of their stories feature exploration of a scientific issue as the primary focus, to the detriment of actually having a robust story. Here we have a case in question. A scientist developing a technique for treating serious burns through lengthy immersion in a liquid-filled tank becomes the first person to benefit from the technique (and what kind of co-incidence must that have been!). The scientist undergoes the mental stimulation which is part of the therapy whilst submerged, which takes the form of him reliving, in effect, playing Doom as a youngster, which includes lengthy descriptions thereof. Vajra attempts to make the story flow through presenting it through several viewpoints, although the ‘rabbit out of the hat’ at the end of the story, in which one of the doctors in an ex-TV star, is somewhat bemusing in its pointlessness. Lori Ann White and Ken Wharton. Mixed Signals. A scientific experiment is facing difficulties with an unexplained source of noise interfering with their readings. Some way down the road, a nuclear reactor station is having problems of their own. When a bit of match-making throws together a staff member from each facility, the couple are able to make a connection. Some fairly complex stuff about gravity waves is included, and it transpires that the problems are being caused by intelligences from another dimension attempting to communicate. A drama unfolds as the powers-that-be attempt to clamp down on the situation, leaving the young couple with no alternative but to get engaged in some pretty direct action to ensure that First Contact is a two-way process. In the end we are told that we may just be a staging-post, which is a tad disappointing. Generally speaking, fairly routine Analog fayre.